Oh my goodness SO GOOD!!!!! So good. So. Good. I waited for some time to even start this book, wanting to give myself over to it with abandon. It took me a few weeks to read it, and I enjoyed every single bit. I got started on the Wheel of Time several years ago on the recommendation of a friend. If you like Game of Thrones, if you like House of Cards, if you are a fan of epic stories with a whole world of characters and interweaving plot lines, this is for you. 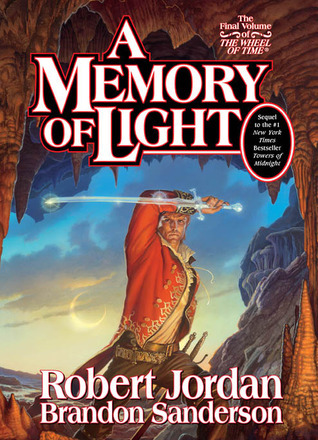 A Memory of Light is the 14th and final book in the series. Some books were better than the others, but I have found the last 3 in the series to be awesomely climactic. With so much of a build to "The Last Battle", I was concerned that the ending might be disappointing. I really cannot divulge a lot of information, but someone I know but it this way: "It was not the ending, but an ending." I fully agree, and I think Sanderson did a wonderful job of taking the work that Jordan began and knitting it together into a final culminating story. It was appropriate. It was satisfying. It left you aching for more, but mostly because you just enjoyed the story and you have fallen in love with the characters, not because the end was lacking. I strongly encourage you to get started on this series, just make sure you have the time on your hands to do it. If not, you will start ditching other daily activities (showering, sleeping, etc.) to read - it is that engaging, and it routinely gave me chills. Five thousand thumbs up for me on this cycle. Oh, I'm SO Glad to hear that this series ends on a high note. I've been frustrated trying to get through some of these middle books (I'm on book 9 now) and have wondered if it's all going to be worth it. Glad to see that there will be light at the end of the tunnel! !